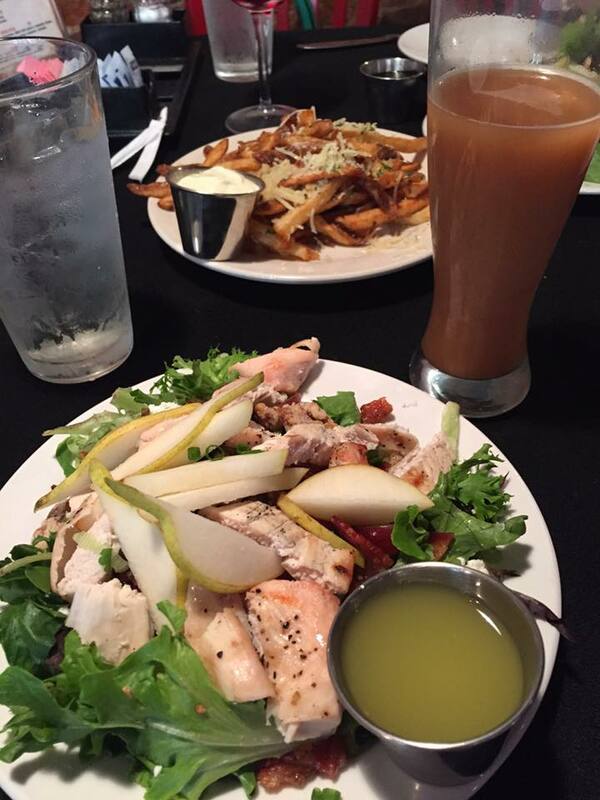 Weigh-in Wednesday 9.30.15 | In It to Lose It! I am actually updating this blog even though I am not quite 1/2-way done with my fall travel season! I am in the office all week this week and leave again on Sunday, so I figured I’d better post an update. Travel season is HARD, you guys. As in–I spend all day driving around big cities going to high schools to talk to students about our university. Then, most evenings, I spend 2-3 hours standing up behind a table at college fairs. This leaves little time for exercise, AND I have to eat out for every meal. It is tough to make good decisions, but I am proud to say that I utilize my hotel gyms like whoa and try my best to eat healthy 1/2 the time or 3/4 of the time I am out. It’s tough! I hadn’t been on the scale since before I left for my first trip in mid-September, but it looks like the last time I blogged was late August. So, I am measuring my results from yesterday since then. Looking at my last weigh-in, it looks like that’s a GAIN of 1.0 pound. I am actually really impressed by this, considering how difficult travel can be and that I stopped counting points for it. 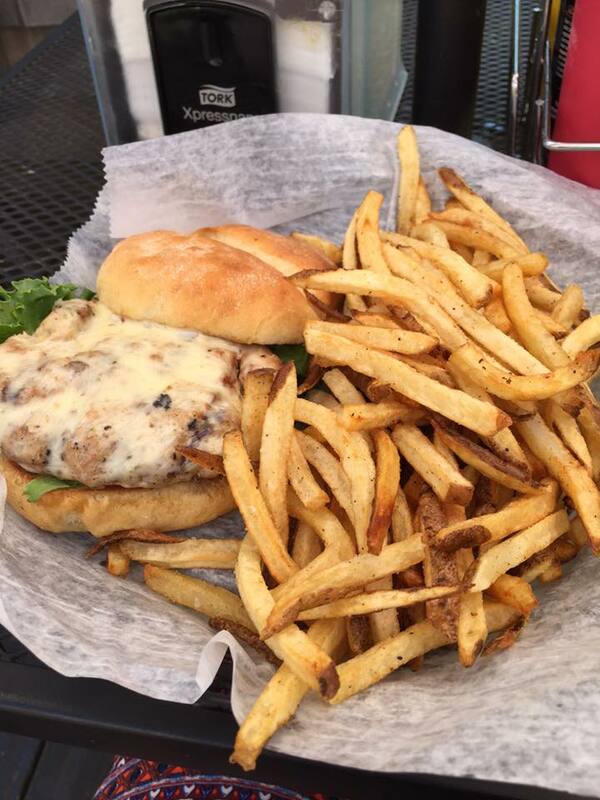 It is far too difficult to count weight watchers points (especially in Nashville, where instead of eating out most of the time, the fair organizers feed you and you are starving 24/7 and you will eat anything and everything) on the road! But I am pretty satisfied with this. It puts me at 170.6, which is not too shabby. 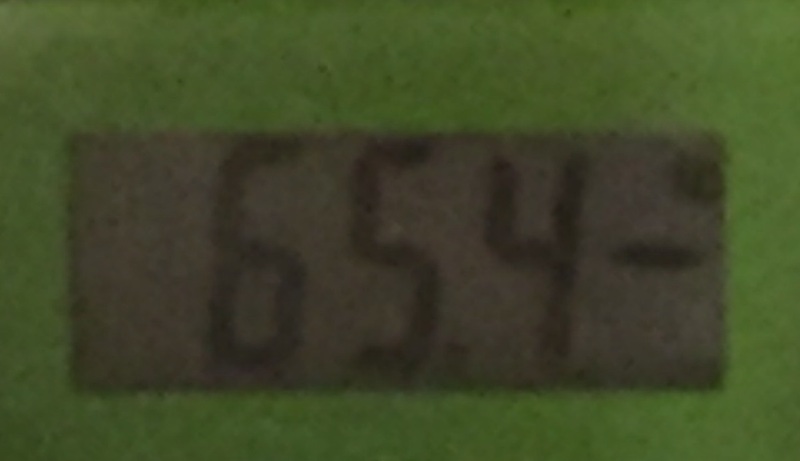 I have wanted to be at 165 for my Disney World vacation in mid-December. Although that is *probably* do-able, I have two more big weeks of travel left, and I may end up gaining another pound or two before it’s all over. Then it’s back to counting points and working it all off! At any rate, that’s all I got for now. I am gone the next three weeks, so my next update will be almost exactly a month from now. Let’s keep our fingers crossed that it won’t be terrible! Love and miss you all! 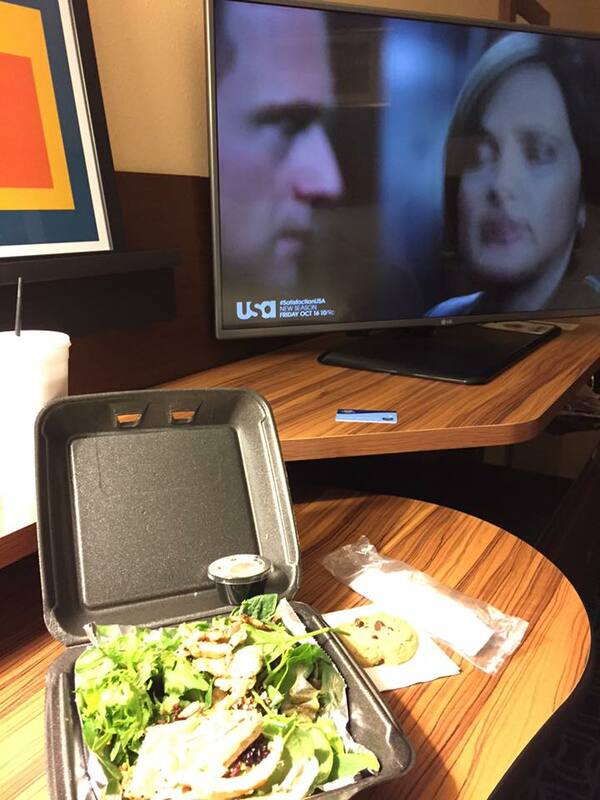 By the way, to prove that I am eating SOMEWHAT healthy some of the time, here are some pics of my food from the road! Jamaican food from “Calypso Cafe–East” in East Nashville, TN. HIGHLY RECOMMEND. 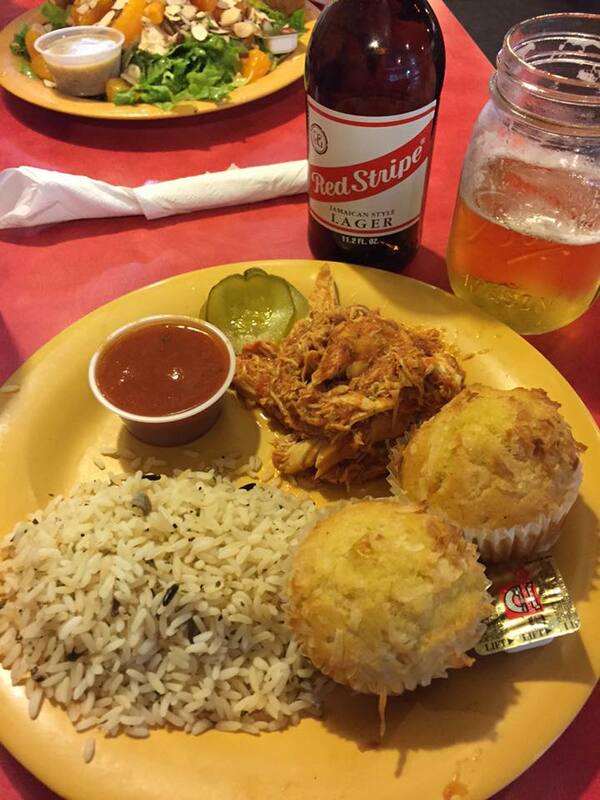 Jerk white bbq chicken, boija (sweet cornbread) muffins w/ coconut, and wild rice–complete w/ a Red Stripe! 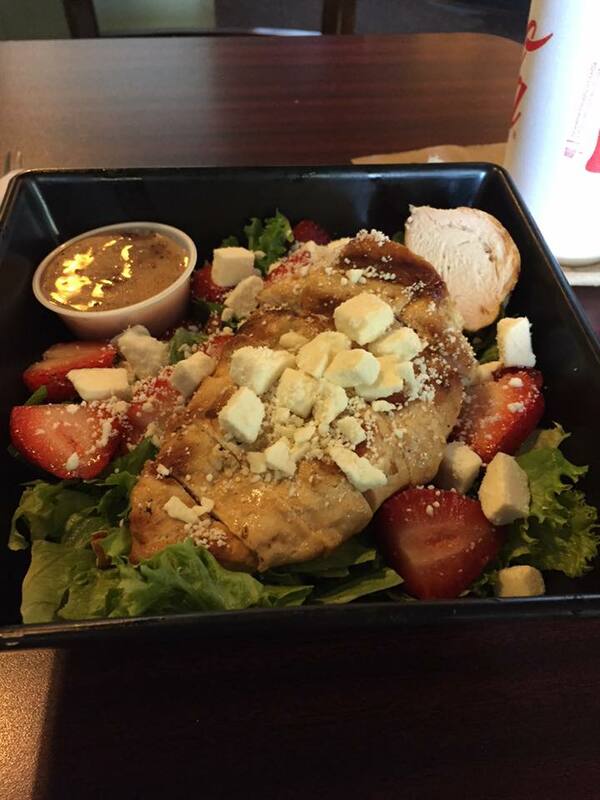 Strawberry chicken salad from “Chill Spot” in Brentwood, TN–feta cheese and fruit vinaigrette of some type…yum! Sorry about the gain but that’s pretty impressive that you had all those wonderful meals and not gained like 15 pounds (because I totally would have especially with all the travel that you do!!) You go girl!